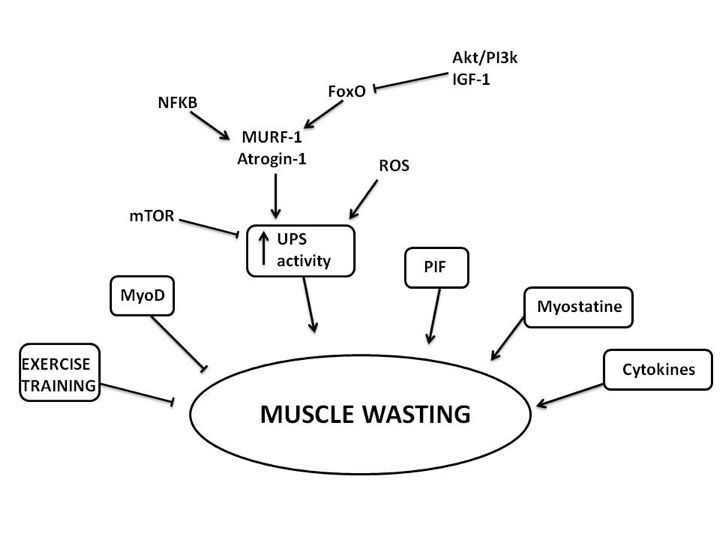 Muscle wasting is a degeneration of the muscle tissue that can derive from several patho-logical situations, but most of the times is caused by a condition of cachexia in patients with cancer or other diseases. This degeneration results from a decrease in protein syn-thesis and an increase in protein degradation. This is caused mainly by the overexpres-sion of ubiquitin-proteosome-system (UPS) elements, under the control of factors re-leased in cachexia that lead cells toward a catabolic rather than an anabolic pathway. Both skeletal and cardiac muscles can be affected by muscle wasting and until now an effective treatment is unknown. Only experimental trials of exercise training bring to a recovery of mass loss, but many researchers think that a potential future treatment may be represented by stem cells.